Summary : This is a deep dish joint for locals. 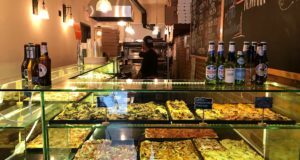 Although I was a fan of the old-school neighborhood vibe, the pizza itself was a little heavy -- even for a deep dish pie. Earlier this year, when I was speaking with a friend from Chicago about deep dish pizza there, she raved about a place called Pequod’s (2207 North Clybourn Avenue). When I had visited Chicago last summer, I ate excellent pizza at Great Lake, Spacca Napoli, and Lou Malnati’s — but the latter was the only deep dish place I made it to. 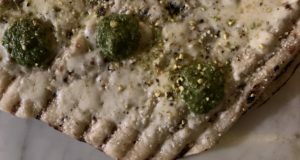 I thought it was excellent as far as deep dish pies go. 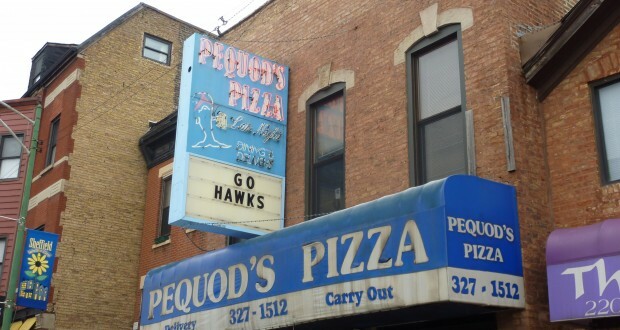 I recently made it back to Chicago (I was passing through on my way to The American Pizza Championship in Milwaukee) and the first and only place on my list of pizza places to try was Pequod’s. I’d been told that while places like Lou Malnati’s and Giordano’s cater to tourists, Pequod’s is where locals go to get their deep dish fill. It makes sense. There are more than 30 locations of Lou Malnati’s and 55 Giordano’s; they feel like chain restaurants when you walk inside. 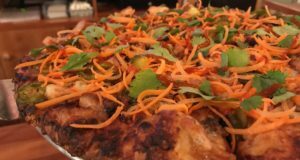 Pequod’s, with only two locations in Lincoln Park and Morton Grove, feels more like a bar around the corner that happens to serve great pizza. And they were completely full at 2PM on a Saturday afternoon. The pizza at Pequod’s is… well… filling. So filling that you almost feel disgusted by every bite you take. But isn’t that what deep dish pizza is suppose to do to you? My friend and I ordered one medium pan pizza, half with mushrooms and onions ($15.95). It would have been enough for a least one other person. There was so much cheese on the pie, it was difficult to distinguish between slices. It felt as if I was digging a spatula into the pan and grabbing whatever part of the pie came up. It definitely didn’t hold together as well as the pies at Lou Malnati’s. But can you really judge a deep dish pie on that? In fact, I find it hard to judge deep dish pies in general. I stuffed my face with cheese and sauce and dough. It was delicious. But I felt bloated after. Would I rank it among some of the best deep dish pizza I’ve had? Sure. Do I understand why people eat deep dish pizza in the first place? Not quite. I’d send folks to Great Lake and Spacca Napoli before I’d recommend they take their chances on some deep dish pizza. But if that’s what you’re looking for, Pequod’s is where it’s at.